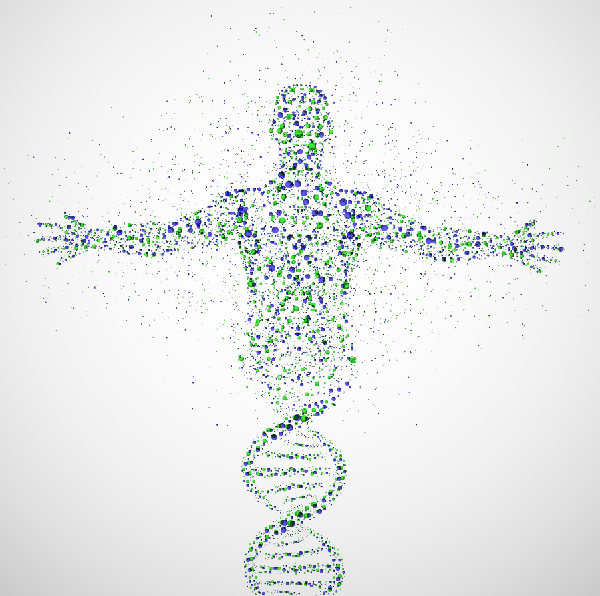 The health impact of the vast gene pool in our guts has long been underrated. You will probably remember my previous articles on glutamine - articles that draw an overall very mixed picture of the usefulness of this gluconeogenic amino acid. If you have been around "forever", you may yet also remember that there's one thing glutamine appears to do that no-one actually has on the radar, when he or she's browsing the storefronts of his or her favorite supplement vendor: Improvements in insulin sensitivity as those I've written about for the first time in 2010 and downstream anti-diabesity effects as they've been demonstrated more recently by Mansour et al. (2014) in a quite impressive 6 week study, in the course of which "3x30g/day Markedly Improved Cardiovascular Risk Factors & Body Comp in 6 Weeks" (reread the full article). Now, back in the day, I was not really able to explain how "exactly", the most abundant amino acid in the body was able to induce significant decreases in body fat even though the subjects were not dieting. With the publication of the results of a recent study from the State University of Campinas in Brazil, however, the evidence that these benefits may be a consequence of the modulatory effects of glutamine on the (pro-inflammatory) microbiome of obese individiuals are accumulating. In said pilot study, Alessandra Zanin Zambom de Souza and her colleagues aimed to "determine whether oral supplementation with L-glutamine (GLN) modifies the gut microbiota composition in overweight and obese adults" (de Souza. 2015). "In this double-blind, 14-d study, participants [thirty-three overweight and obese adults, ages between 23 and 59 y and body mass index between 25.03 and 47.12 kg/m²] were randomly divided into two groups: glutamine (GLN) and alanine (ALA). We used alanine as control to give the volunteers the same amount of calories. Participants received a kit containing small packs with 15 g of amino acid (GLN or ALA) each, with varying artificial flavors, to be diluted in 200 mL of water at the time of intake. Participants were instructed to take two packs at any convenient time of the day, totaling 30 g/d of amino acid, while maintaining their usual diets and physical activities" (de Souza. 2015). 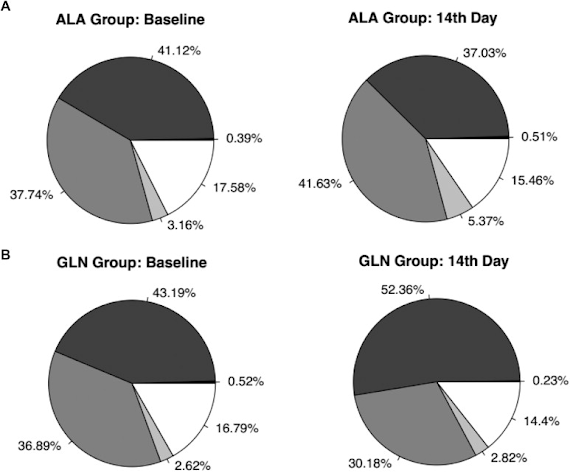 After 14 d of supplementation, adults in the GLN group exhibited statistically significant differences in the Firmicutes and Actinobacteria phyla compared with those in the ALA group. Figure 1: Gut microbiota profile. Data were collected before and after 14 d of supplementation with ALA: alanine (n = 12) or GLN: glutamine (n = 21); Relative percentage of major phyla found in the gut microbiota of participants in (A) ALA group and in (B) GLN group at baseline and day 14. Major phyla found were Actinobacteria (black), Bacteroidetes (dark gray), Firmicutes (gray), Proteobacteria (light gray), and others (white | de Souza. 2015). At first, this change may appear to be pretty arbitrary, but in conjunction with the previously cited results of the Mansour study (reread it) and the existing evidence suggesting that the ratio of Firmicutes to Bacteroidetes, a good biomarker for obesity (Ley. 2005 & 2006 | Ley et al. (2006), for example found a linear increase in bacteriode abundance with weight loss), the observed decrease in the F:B ratio from from 0.85 to 0.57 in the glutamine group may in fact provide a mechanistic explanation for the previously observed medium-term benefits of high-dose glutamine supplementation in the obese. Benefits that may be augmented by the recently proven and probably mechanistically related ability of glutamine to attenuate oxidative stress and the proinflammatory responses as they would occur, when endotoxins from the gut make it into your blood stream (Cruzat. 2014) - something you may, by the way, also expect to see if you are a green or black tea connoisseur of which Henning et al. have recently been able to show that it induces similarly positive changes in the firmicute to bacteroides ratio as glutamine (Henning. 2015). 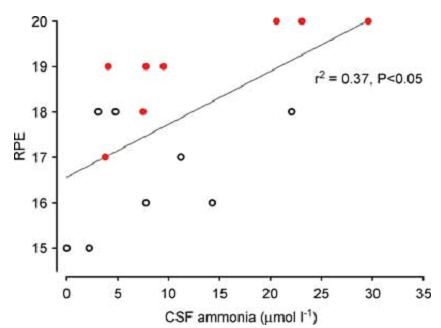 Figure 2: Rating of perceived exertion (RPE) versus CSF ammonia following exercise with (open symbols) or without glucose supplementation (grey/red symbols) RPE values represent the individual scores during the last 15 min of the prolonged cycle trial (Nybo. 2005). And what about ahletes? In view of the fact that studies indicate that exercise can keep the number of potentially proinflammatory gut tenants like Dialister, Dorea, Pseudobutyrivibrio, and Veillonella (all firmicutes) at bay, anyway (Choi. 2013), you may argue that this is not that relevant for athletes. The proven ability of glutamine to counter the fatiguing exercise-induced increase in ammonia (Bassini-Cameron. 2008), however, makes glutamine a potential valuable dietary supplement specifically for those athletes who consume a high protein diet that may - as a consequence of the use of protein as energy source - lead to potentially performance decreasing increases in ammonia (Nybo. 2005) which also passes the blood brain barrier and "might possibly result in the observable central nervous system symptoms of dysfunction which accompany exhaustion such as ataxia, mental confusion and syncope [partial loss of consciousness]" (Banister. 1983). In that, it is yet allegedly debatable, whether other amino acids like citrulline which has been shown to significantly improve the clearance of ammonia from the blood stream (Takeda. 2011) wouldn't be the better choice in terms of their ability to block the accumulation of ammonio during workouts. Reductions in gut permeability or reductions of the number of pro-inflammatory Firmicute and Actinobacteria, however, have not been reported for citrulline, which is why one may have to reconsider the lack of convincing evidence of acute beneficial effects of glutamine supplementation on exercise performance (Gleeson. 2008) in view of the previously shown ability of glutamine to serve as alternative or adjunct to glucose during longer workouts and the more recent evidence of its benefits on the digestive tract | Comment on Facebook! Banister, E. W., et al. "The time course of ammonia and lactate accumulation in blood during bicycle exercise." European Journal of Applied Physiology and Occupational Physiology 51.2 (1983): 195-202. Bassini-Cameron, Adriana, et al. "Glutamine protects against increases in blood ammonia in football players in an exercise intensity-dependent way." British journal of sports medicine 42.4 (2008): 260-266. Choi, Jeong June, et al. "Exercise attenuates PCB-induced changes in the mouse gut microbiome." 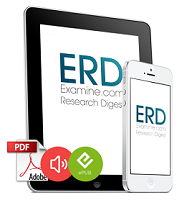 Environmental health perspectives 121.6 (2013): 725-730. Cruzat, Vinicius Fernandes, et al. "Oral free and dipeptide forms of glutamine supplementation attenuate oxidative stress and inflammation induced by endotoxemia." Nutrition 30.5 (2014): 602-611.
de Souza, Alessandra Zanin Zambom, et al. "Oral Supplementation with L-Glutamine Alters Gut Microbiota of Obese and Overweight Human Adults: A Pilot Study." Nutrition (2015). Gleeson, Michael. "Dosing and efficacy of glutamine supplementation in human exercise and sport training." The Journal of nutrition 138.10 (2008): 2045S-2049S. Henning, Susanne, et al. "Effect of Green and Black Tea Extracts on Intestinal Microbiota and Body Composition in Mice Fed a High Fat/High Sucrose/Western Diet." The FASEB Journal 29.1 Supplement (2015): 924-27. Ley, Ruth E., et al. "Obesity alters gut microbial ecology." Proceedings of the National Academy of Sciences of the United States of America 102.31 (2005): 11070-11075. Ley, Ruth E., et al. "Microbial ecology: human gut microbes associated with obesity." Nature 444.7122 (2006): 1022-1023. Mansour, Asieh, et al. "Effect of glutamine supplementation on cardiovascular risk factors in patients with type 2 diabetes." Nutrition (2014). Nybo, Lars, et al. "Cerebral ammonia uptake and accumulation during prolonged exercise in humans." The Journal of physiology 563.1 (2005): 285-290. Takeda, Kohei, et al. "Effects of citrulline supplementation on fatigue and exercise performance in mice." Journal of nutritional science and vitaminology 57.3 (2011): 246-250. Turnbaugh, Peter J., et al. "A core gut microbiome in obese and lean twins." nature 457.7228 (2009): 480-484.